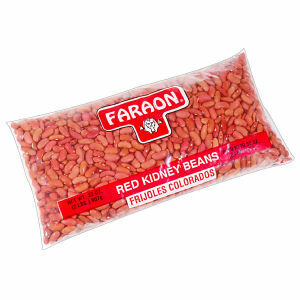 Faraon Red Kidney Beans are packed with great pride by Faraon. Only the very best of these marvelous beans make it into the Faraon bag. Nothing added, just beans straight out of mother earth. Our special packing process give you a product that you will appreciate. High in fiber and carbohydrates, zero fat. Ounce for ounce, Faraon beans are the very best investment you can make to serve in your dinner table. Enjoy.